aaaah, cinco de mayo ... one of the booziest of holidays. this year, mis amigas & i skipped out on the celebration ... mainly due to it being a monday. so we decided to have our own belated cinco de mayo dinner & drinks out ... starting with comida & margaritas at mercadito in river north. 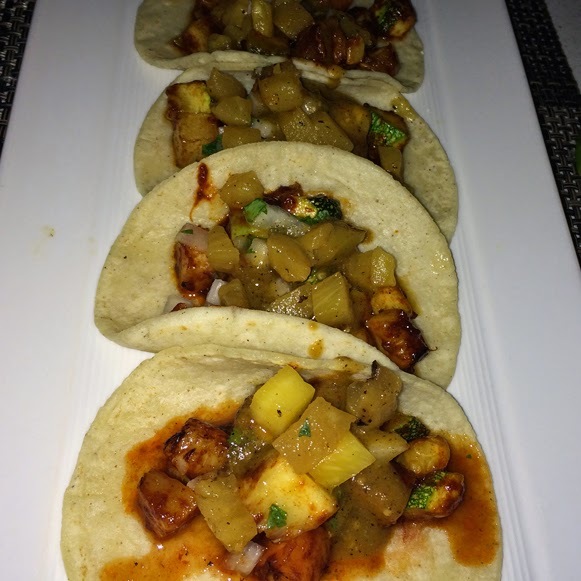 mercadito : "the best authentic upscale mexican restaurant in chicago with flavors created by world renowned chef patricio sandoval." que bueno. tradicional : tomatillo pico de gallo, jalapeño, garlic, key lime & cilantro. toreado : sauteed chile serrano, garlic oregano, tomatillo pico de gallo. 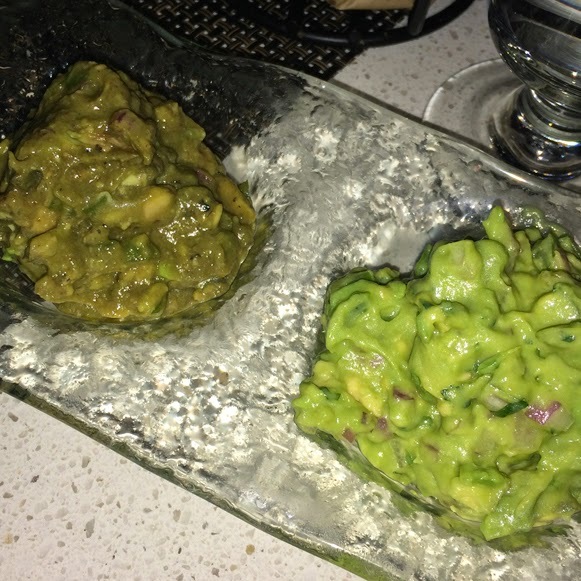 for a mexican place, i wasn't uhb-sessed with the guac. it was good, but not great. and i was really looking forward to eating the toreado, too. part of the issue could be that the tortilla chips are cooked in the same fryer as the fish ... so no chippies for vegans, sub jicama sticks = buzzkill. chile de árbol salsa & grilled pineapple. guys, some of the best vegan tacos i've ever had. the flavor of the chile salsa was just amazing. not kidding. i was iffy on the pineapple, but i even loved that. overall, just super super tasty. oh, and surprisingly filling. but that could have been the jicama talking. these might be my new favorite vegan tacos. i know, i say that a lot. but it really might be true. so definitely worth a trip ... plus, their jalapeño margarita is en punto. Those tacos look amazing! I was checking out their menu and they don't appear to be on it - did you ask specifically for vegan tacos? I was thinking about this place for a get-together and thought maybe the mushroom tacos could be veganized, but these look even better! they aren't on the menu. when i asked what could be prepared vegan, our server said the only tacos that could be prepared vegan were the pork (?!) tacos ... as the sub out the meat for the veggies and use the same sauce on top. i'm not sure about the mushroom tacos! i think there is also a salad ... but these tacos are super delicious, so i'd go for those anyway!! [ Smiles ] They look delicious! thanks for stopping by, renard!